Welcome to The Lobster Trap! The Best and Freshest Lobsters! We have the largest supply of live Maine Lobster in upstate New York. We select the finest lobsters and have them shipped directly from boats in Maine. When they arrive at our shop, we put them in our authentic lobster holding tanks, which replicate their ocean environment and assure freshness. We have the largest supply of live crabs in Upstate New York. We specialize in Golden(East Coast), Dungeness (West Coast) and Blue crabs. Our famous Lobster Bisque is always in stock, and our New England and Manhatten Clam Chowders can’t be beat. Yummy!! We stock all kinds – Littlenecks, Cherrystones, Maine Steamers, Mahogany’s and Wild Oysters. They are all guaranteed to be the freshest and cleanest available! We have a huge selection of fresh frozen fish. We also stock octopus and calamari! Lobster meat is known as one of the healthiest protein sources available. 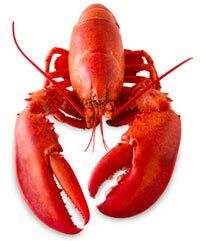 Boiled Lobster contains only 98 Calories, 72 mg of Cholesterol and .6 mg of fat. Compare that to beef, which has 216 calories or skinless chicken breasts with 165 calories. Why Choose The Lobster Trap? One word sums it up…FRESH! We take pride in selling the freshest seafood at some of the lowest prices in the Rochester area. Our non-traditional storefront of a Gulf gas station allows us to keep things simple and provide our customers with great value for their money. Try us! The World’s Finest Lobster Comes from Maine! Maine is world famous for having the most succulent tasting lobsters in the world. That’s why it is the source for all of our “lobstahs” at The Lobster Trap. We are known within the Rochester and Monroe County area of Upstate NY, but we actually have plenty of loyal customers between Buffalo and Syracuse! We supply many restaurants, and we are a resource for fund raising events for fire departments (for example). We also run a catering business called Davie’s Locker which specializes in clam bakes and lobster bakes. Over two-thirds of our business comes from Pittsford, Brighton, Fairport, East Rochester, Penfield, Webster, Irondequoit, Henrietta, Greece, Victor and Mendon.